Hello readers, and welcome to the first offseason article on MetsPlus.com. Yes, it’s the offseason. So, here’s a quick recap of all of the early offseason buzz surrounding the Mets world without talking about the Cricket Games at Citi, or why we need to re-sign Cespedes. Collins gets a Two-Year extension through 2017- Yay? I mean, Yay! I guess I have to give Collins credit for his impressive performance this season. But if it wasn’t for Sandy’s late July aggressiveness, I guarantee you Collins is looking for a job. Anyway, I’m happy for Terry, who finally got to taste the Postseason and then some. Not every manager gets to do that. However, I’m not sure how much longer Collins wants to manage. I think he’s a nice guy, but he’s not a great in-game manager and his age shows during the game. He sounds so depressed after losses and has to take the blame for a lot of the miscues. I think he stays through 2016, then he leaves. Managerial contracts aren’t that “official” anyway. GM collapses- Michael Baron of JustMets.net (a better blog than this place, check his site out) was standing two feet away from Mets general manager Terry Collins when he collapsed mid-presser due to the bright lights in the media room and the fact that he didn’t have any breakfast that morning. While I’m glad he’s OK, I imagine it was a scary moment. Lucky for him there is no video of his collapse. That was something that didn’t need to be released and wasn’t. Good job there. Monday’s are no longer for the Military- It looks like the Camo jersey’s and caps are on their way out after two years as an official alternate uniform. 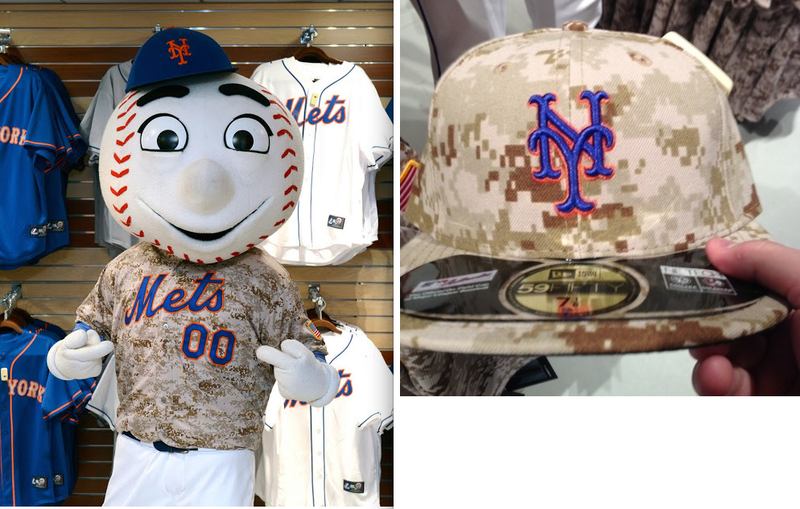 Strangely enough, the Mets went 4-0 when they wore their Camouflage get-up. However, I’m very happy to see them go. While I’m always happy to support the military and think we should continue to do so on days like Memorial Day and July 4th, it was not a good idea for the regular Mets uniform rotation. It was a flop at the Mets shop, and it honestly looks ugly with the white pinstripe pants. -The GM meetings take place in two weeks down in Boca Raton, Florida. The GM meetings is generally considered the beginning of the offseason signings wise. – The Mets open the season next year with the same team they ended the season with this year, the Royals.